By a great sleight of hand, the A12 dual carriageway threads through the most intensely rural heart of Suffolk, and yet a mile or so from its course you wouldn't even know it was there. Tiny, beautiful villages are joined by lattices of tiny lanes which meander sleepily about the fields and copses of sprawling, empty parishes. They are in no particular hurry to get anywhere. In the villages you can still find the occasional old-fashioned pub, and for miles around the churches are all open every day, pretty much. Parham has no pub, but it does have a fascinating church. 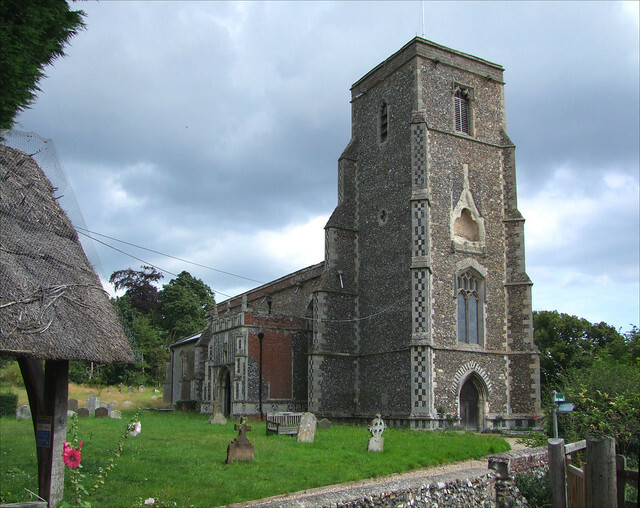 The heart of the village, pronounced Parrum, is not far off the busy road which connects Framlingham to the A12, and the church is set in a little dip with ancient houses in attendance. It dates from a major rebuilding of the late 14th Century. You enter the churchyard by a pretty thatched lychgate in the north-west corner, and the graves sprawl away south and eastwards, an attractive but particularly uneven and bumpy graveyard. At first sight, the most striking feature of the exterior of the church is the large niche on the western face of the tower. It probably held a rood group, the crucifixion in the middle, with John the Evangelist and Mary the Mother of God on either side. You can see that it would have had a most elaborate canopy. The eastern buttresses of the tower are parallel to the tower eastern face and there are no battlements on the tower, making it seem rather severe, especially with the low nave roof. The nave windows are tall and stately, making the church seem rather bigger than it actually is. There was a big refurbishment a hundred years later, hence the large window beneath the niche, and the grand north porch, now a vestry. Unusually for Suffolk, you enter the church from the west, beneath the gallery. The interior is surprisingly spacious, given that there are no aisles. The building is full of light - there is very little coloured glass, and the dado panels of the rood screen were removed in the 1880s, leaving just the tracery painted in a gay red and green. It gave Cautley the horrors, and even made Mortlock tut, but I rather like it. The whole building has a sense of space because of it, unusual in a church so comprehensively restored in the 1880s. The reredos beyond is a simple and seemly structure, a cobbling together of 17th century woodwork with a picture of the Last Supper in the Russian style. I would have liked to have known where it came from. Above it is some good 15th Century glass, albeit restored. Four angel musicians in the upper tracery look on with the serious faces of that century. England's medieval churches are deposit and treasure houses of the folk memory of their parish. Here at Parham the Corrance family were the people at the Big House. Frederick Snowden Corrance was the Conservative MP for East Suffolk, and in 1872 his nine year old only son Charles laid the first stone (though it was probably a brick) of the village school. The building has now gone, but the dedication plaque survives, and is in the church. It notes that the school was built by voluntary contributions of the landowners of this parish. Another plaque records that, in the following decade, the roofs and pews were replaced by a bequest from George Corrance, who was presumably Charles Corrance's grandfather. His uncle, another Charles, was vicar at the time. There is a good set of Restoration royal arms, suggesting the locals were glad to see the back of the Commonwealth. But, curiously, if the 17th century communion rails look odd, it is because alternate balusters have been removed by someone who, presumably, thought it was a good idea at the time. Remembering Archbishop Laud's main reason for installing such things in the first place, perhaps they just wanted to let the dogs back in.